The Sea Sheppard activists are fighting the good fight, but is it the right fight? Summer in Australia means four things. Beach, cricket, beach cricket and the ongoing crusade of activists against Japanese whalers. Every year a fleet of Japanese whaling vessels voyage south deep into icy Antarctic waters to harpoon a quota of Minke, Humpback and Fin whales. Given the International Whaling Commission’s (IWC) moratorium on commercial whaling and Japan’s tenuous excuse of ‘scientific research’, it’s no surprise that continued Japanese whaling is one of the most thoroughly-opposed issues for conservationists around the world, let alone in Australia, whose shores are nearest to the harvest. It plays out like a periodic naval epic. 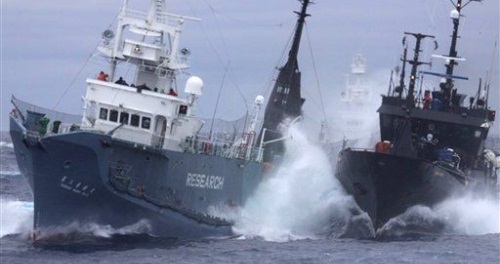 Animal Planet even filmed it and called it Whale Wars. The Japanese flotilla, replete with security vessels and whaling ships venture far into the Southern Ocean, stalked by the Sea Sheppard Conservationist Society’s fleet. Confrontation is inevitable; ships are damaged and then both sides accuse each-other of reckless life-endangerment. And while it’s Master and Commander all the way, we get no closer to putting a definitive end to harmful whaling. The Sea Sheppard Society crew, led by a tenacious and very direct man in Captain Paul Watson, are the self-appointed saviours of the marine mammals. They argue that the IWC is too weak (despite the ban on commercial whaling, more whales are being killed each year by Japan, Norway, Iceland, Denmark, Russia and the United States), governments are too slow and that other conversationalist groups such as Greenpeace, are too futile. According to the mission statement, Sea Sheppard “uses innovative direct-action tactics to investigate, document, and take action when necessary to expose and confront illegal activities on the high seas.” They fly a Jolly Roger, coat their ships in camouflage livery and imagine themselves as fierce ocean crusaders. It’s clear Sea Sheppard activists embrace the pirate image they’ve fashioned for themselves. But pirates they are not, even though the media tosses that term around a little too loosely. They are obstructionists and saboteurs. They’ll use near any means available to them short of direct violence to grind whatever operation they oppose to a halt. Some of the gambits ordered by Captain Watson against the Japanese whaling fleet, in a campaign they call (with just the most subtle cheek) Operation Divine Wind, include disabling propellers with cable; tossing butyric acid bombs (fart bombs, essentially) and blasting water cannons (a defence also used by the whalers). In the past, Watson has gone as far as intentionally scuttling target boats with ram raids and limpet mines as they sat in harbours. Watson was even accused in 2010 by a former skipper of ordering the sinking his own ship – the $2 million Ady Gil no less, to “garner sympathy with the public and to create better TV” after it sustained damage from a dramatic collision with a Japanese ship. It’s an extreme and more often than not, completely illegal path treaded by Watson and his followers. Some claim it borders on terrorism. Watson doesn’t even try to shrink away from such accusations, “There’s nothing wrong with being a terrorist, as long as you win. Then you write the history,” he said back in 2002. Watson’s attitude is that of a vigilante apostle of mother earth. To him, the protection of the whales and other besieged creatures around the world is a duty more urgent than the law usually allows. He’s a divisive character; labelled a hero by some and an arrogant egomaniac by others. He’s cocksure, intelligent and savvy, putting as much effort into leveraging the media as he does captaining his ships. He’s a man who instructs wannabe eco-warriors to lie and exaggerate if necessary to capture a headline. He learned that from Ronald Reagan. His cause is noble, however, even if he isn’t; and he is succeeding in reducing the number of whales being killed. What he is not succeeding at, though, is bringing this issue any closer to ultimate resolution. In fact, if anything, it only drives the root of the problem deeper and firmer into the ground. Here, we nearly all agree whales should not be hunted. But is it really any different in Japan? It’s true that Japan is a nationalistic country prided on tradition and whaling is deeply woven in its cultural fabric. But it’s gross oversimplification to say Japan are out to preserve historical cultural delicacies. Several reports indicate there is actually very little demand for whale meat in Japan. A traditional dish maybe, but certainly not a staple in Japanese households. An opinion poll obtained by Greenpeace in 2008 suggests the Japanese public are far from overwhelming supporters of whaling in general. Specifically, 71 per cent of those surveyed opposed whaling beyond Japanese waters. It’s extremely difficult to find definitive information on public perceptions of whaling, which seems to point to one thing. Japan is a modern superpower, remember, and tradition doesn’t oil the cogs of a superpower – but the dirty grease of money, power and politics does. In December 2010, the world caught a glimpse of corruption within the Japanese whaling industry, and resultant exposure of the Tokyo Two case intensified scrutiny from both outside and within the country. It’s alleged that the entire operation is rife with embezzlement, political favours and other such corrupt nonsense commonplace in bureaucratic industries (remember the Australian Wheat Board?). There is simply too much money and political deals invested in Japan’s whaling industry that it’s impossible to drop the anchors and call it a day. What’s rarely pointed out is that part of the reason Japan survived and flourished after its post-war decimation was its modernisation of commercial whaling. Equipped with Western technology and permission, commercial whaling provided desperately-needed cash, food and jobs. It was solid bedrock that permitted other industries such as electronics and automobiles to boom. Japan’s fisheries ministry is one of the most important, home to many a powerbroker, so protecting its economic interests in continued whaling is a smart move for career-minded Japanese politicians. What coal mining is to Australia, whaling is to Japan, Public opinion of ethics or conservation is of secondary value to jobs and the economy. And of course, there are filling cabinets in parliamentary offices stuffed with contracts, deals and promises. Any rhetoric about tradition and history is used to stir the Japanese public on side, or at least distract it from conversationalist sympathy. Commenting on activists, Japanese officials declare them to aggressors; foreigners meddling in Japanese affairs – attacking loyal Japanese workers. All of a sudden, the whales are forgotten and it’s war again. East and West at loggerheads again – the West reprimands the East and the East defiantly resists foreign will imposed upon it. Which brings us back to our so-called pirates. What we have are a rough and tumble group of militant partisans for whom action and idealism come before rationalism and conciliation. They’ve appointed themselves the vanguard against an issue that is a mind-scatteringly complicated mess of money and politics and law. And both sides paint a picture of war on the high seas – where whales are no longer the gentle leviathans of the ocean, but moral territory, a principle to be quarrelled over. As Paul Sheehan from the Sydney Morning Herald stated, “The great flaw in the environmental movement is the sanctimonious belligerence of so many of its protagonists, the lies and exaggerations, and the assumption that they are above the law and can disrupt and destroy the businesses of other people who are operating lawfully.” He’s dead right; the Japanese are operating lawfully, albeit on preposterously thin ice. Back in March 2010, the Australian Government announced (under pressure from the public) that it will take Japan to the International Court of Justice over the lawfulness of its whaling operation. It will test how thin that ice really is. This is a glacially-slow process however, far too slow for the zealous Sea Sheppard crew. They say the longer they wait, the more whales are killed. This is also true. But the longer they continue to up the drama in their audacious crusade, the more the tide of opinion will turn against them. The more laws they flout in the name of the whales, the more distance they place between the general public who want to the do the right thing – but want to do it the right way.